I am not sure how to write this article yet: should I say a lot of words about this marvelous piece or let the pictures and the title say it all? Here it is the way it looks, as always the face of the watch, the case back and the movement. The watch is on original Citizen Chrono Master strap. Back to the watch: It is the usual fully polished stainless steel multi faceted case and gold inlayed screw in case back. One thing about this one that makes it a little more interesting is the fact that the lugs distance is 18mm so it is supposed to be on strap only, not like most of them that are 20mm. I find the 18mm more suitable for the shape and design of the watch when it comes with a strap. More elegant. It is ok on 20mm but 18mm seems to be just perfect. You can read about the original strap HERE. The crystal is different a little bit too, in the way it connects with the case, so not all Chrono Master crystals are interchangeable. It is a mineral one, slightly domed, that comes attached inside a steel ring making these parts a single piece. The dial is gorgeous, silver, with a sun burst pattern. It has an oval day window at 12 that shows the days only in Japanese (Sundays in red and the rest in black) and a date window at 3. The hour markers are applied and match the hands perfectly. (polished with a central black line – on 12 there are two lines-) No luminous material was used. It was not needed. The legibility is excellent. The inscription on the dial is printed in black and it may look crowded but it is so small and delicate you can hardly notice it unless you want to. And why wouldn’t you stare at it? The silver Citizen logo is applied under the day window and the gold plated eagle logo at 6. One gold eagle on the dial, one gold eagle on the case back. (pay attention that only Special edition are having the gold dial eagle, the rest are silver) A special Chrono Master indeed! Yes, the case back… it doesn’t get better than this! That gold inlay is a piece of art by itself! In between the dial and the caseback we have the movement. 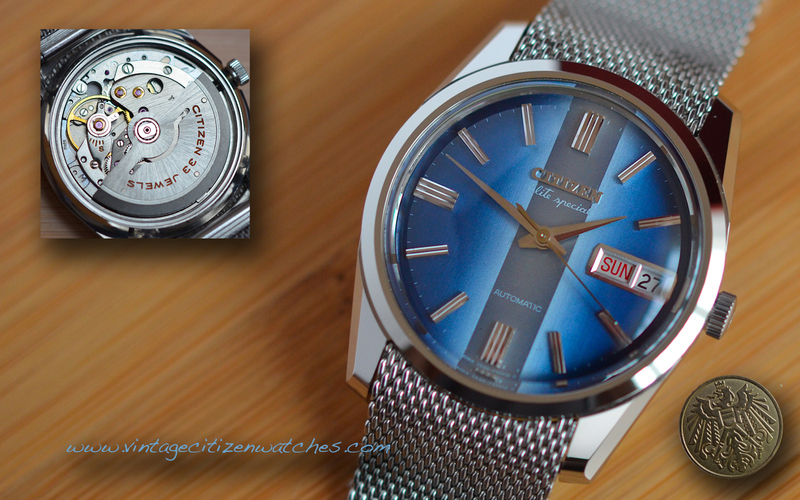 The in house (like all Citizen) calibre 5250, 35 Jewels, running at 18,000 bph. What about it? Well… Chrono Master Superior Chronometer. Hacking seconds, automatic, hand winding also possible. Quick set date. At the time it was the most expensive one at 39000 yen while the 33J day date chronometer was only 29000. Even my Holly grail watch, the 500m diver was cheaper, at only 35000. Find one today at this price! LOL! So… I guess there is a lot to say about this watch, but I will stop here for now. Feel free to leave your comments below! Christmas is here and the year has come so fast to yet another end. Time passes so quickly and our watches are nothing more than witnesses of this process, even though sometimes they remain in perfect state for many, many years, unfortunately unlike us. It was an insane watch year for me as far as Citizen collecting is concerned. Today I want to wish you a Merry Christmas and a Happy New 2016! May you enjoy your collections in good health my friends! Because it is a special time of the year, what better watch to introduce to you if not a special one? Here it is the Citizen Chrono Master Elite Special! As you can see, it is not the “usual” Chrono Master (read more about Chrono Master watches HERE). The blue, beautiful dial, sets it apart. It is not at all a conservative look and it is striking bright blue in direct light and almost black in the shade. On the center it has a different vertical shade and depending on the angle on what you are looking at it, it can appear darker or lighter than the rest. The hour markers are applied and there is no luminous material. The hands are simple, polished and specific to this model only. On three o’clock there is the day and date frame. This is also a characteristic of this model, with a shared window for both. The movement inside is Citizen calibre automatic 5240 with 33 jewels, beating at 18,000 bph (I wrote about it before on my site). It is the one that you can find in a day-date Chrono Master. Really nice finish, hacking, quick set date and really precise. The case is shared throughout the range, made of stainless steel and the finishing is exceptional. It is all polished with mirror like surfaces with perfect angles. The case back has the famous eagle gold inlay and, I know I use a lot this words a lot when talking about Chrono Masters, but it is awesome. The bracelet is a rare find, 20mm wide steel mesh bracelet. Some Chrono Masters have a lug distance of 18mm but not this model. Those with 18mm come with leather straps only. Have a wonderful Special 2016! The case is exactly the same, entirely polished stainless steel, screw retained case back with the awesome gold eagle inlay medallion. The mineral crystal is slightly domed with a concave inner surface. The crown is signed “C”. The movement is the Citizen calibre automatic 5240 with 33 jewels, beating at 18,000 bph and can be hand winded too. In this case the watch is Chronometer grade but the case number is correct for day date version, Chronometer or not. The lug distance is 20mm and they came either with a mesh bracelet or with a leather strap. One more difference on these two watches presented here is the dial code, even though they are exactly the same. The hands are the same and so is everything else. Read more about the regular Chrono Master Auto Day Date (not Chronometer) HERE. 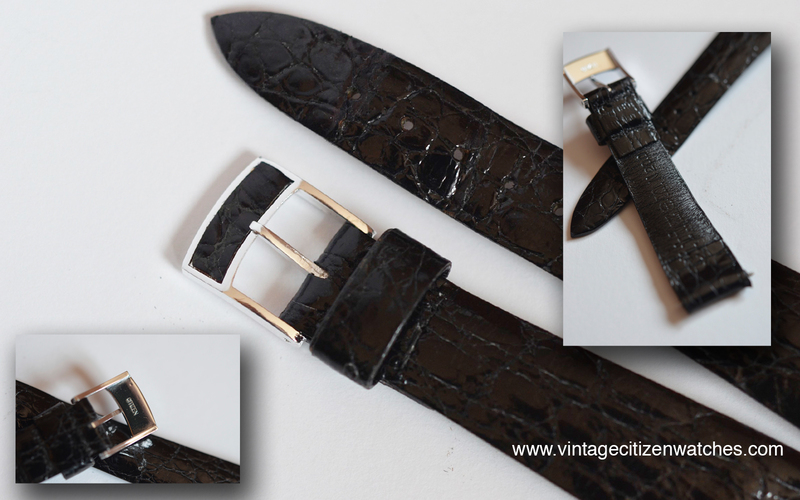 As any collector of vintage watches knows, finding a certain watch is difficult but often it is more difficult to find an original strap with an original buckle. This is so true for Citizen Chrono Master. Unfortunately the leather gets dry in time and cracks easily. The glue as well dries and the strap might disintegrate if used. But it is such a joy to find a good one! Here it is, the original Chrono Master strap and buckle! The Chrono Master came with a lug width of 18mm for straps and 20 mm for (straps?) bracelets. I have yet to find a 20mm strap for one. This strap is made of leather, tapering from 18mm to 14mm. The top part as well as the underneath is black and is branded. The alloy (aluminum?) buckle has a black leather inlay. Read about the Chrono Master box HERE! 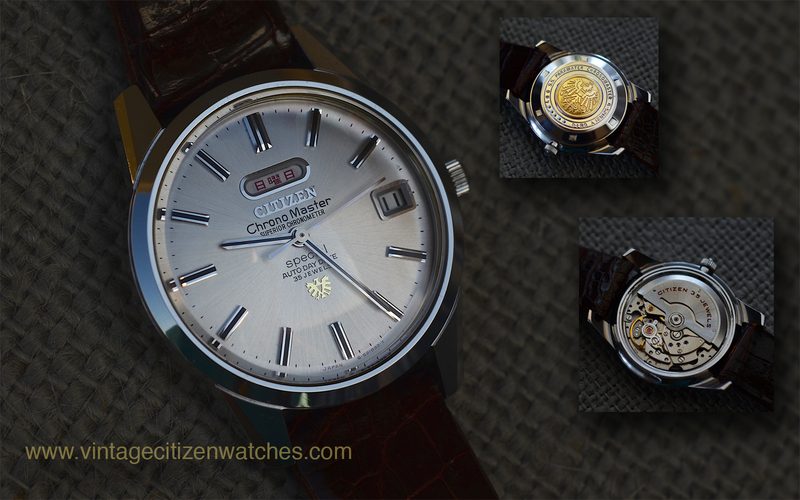 I have a few years of collecting Citizen and still I find my self often amazed by rare pieces that surface without me even knowing that they exist. 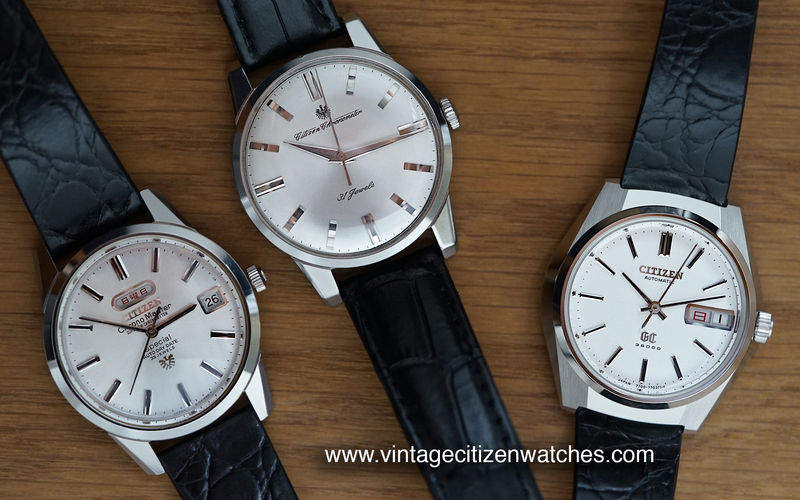 One of these is the one I am writing about right now: the Citizen Chrono Master Chronometer Date. But, why is it special? After all, there are a lot of Chrono Masters, and even though they are well made and can fetch a high price, they are not ultra rare. Well… some of them are more than rare, and this is one of them. Unfortunately it is not mint but I am sure that with the help of a good watchmaker it can get as close as possible to original condition. The most important feature of the watch is actually the case back. Most of the Chrono Maters have a gold eagle inlay, but this one has an engraved one. (magnify the picture for better details) The only other one I saw this way is the Citizen 500m diver that I already wrote about. So this makes it really interesting and the only one I saw this way in all these years. I wish I could find more info on this model but haven’t yet. So, stainless steel case back and polished with a brushed frontal surface case. The crown is signed and made of stainless steel too. 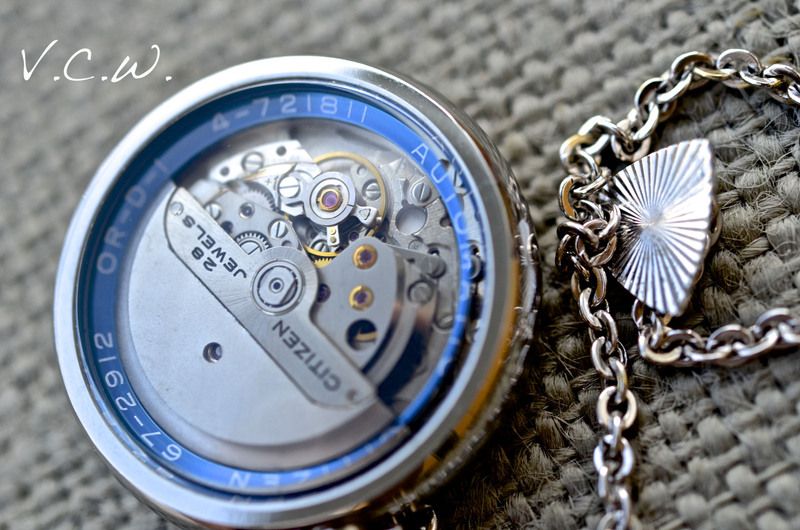 The movement is a piece of art, Chronometer grade, manual wind, 25 jewels. It doesn’t hack and the day changes by advancing the hands past midnight. It has it’s own serial number. The domed acrylic crystal suits the watch perfectly and lets the light shine on the dial. 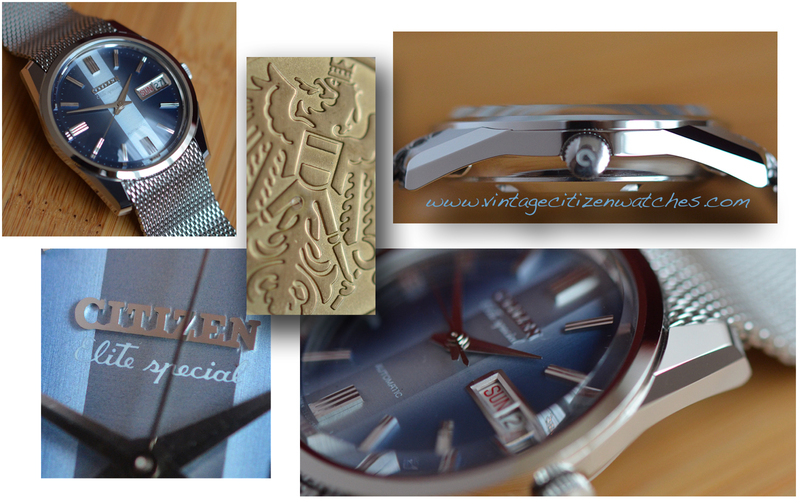 The hands are polished and so are the applied Citizen logo, the eagle logo, the hour markers and the date frame. The printing is black making it simple and elegant. One of the added bonuses is the original Chrono Master strap (doubt the fact that the buckle is original though). 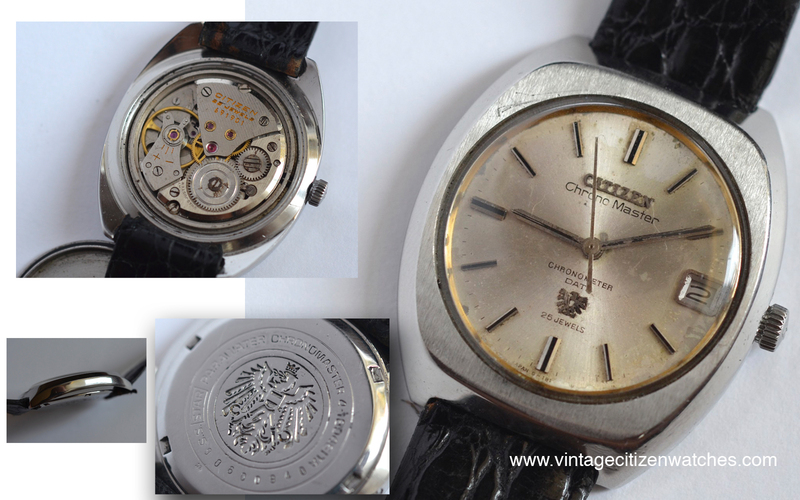 All things considered, this is another rare, important watch, in need of loving care, cleaning, polishing and servicing. It deserves this because indeed it is the real “diamond in the dust” story. Sometimes it is a lot harder to find an original strap or an original box than finding the watch itself. 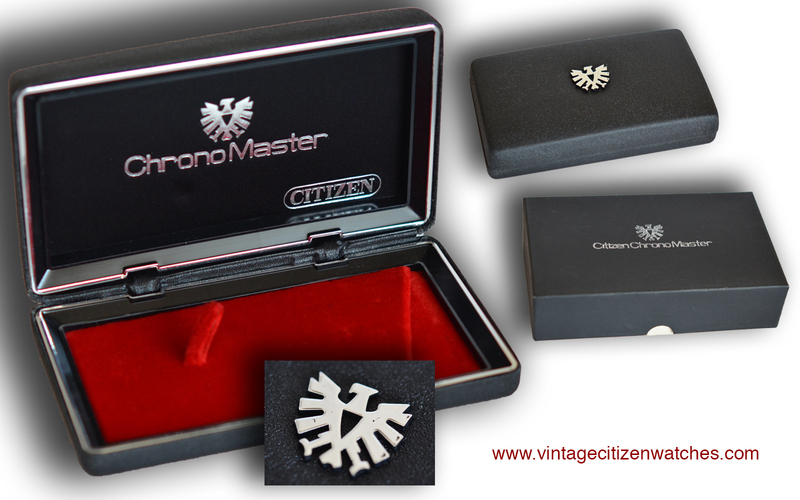 One of the most elusive boxes for a Citizen collector is the one that came with the Chrono Master line. The outer box is made of cardboard and the inner one of plastic. 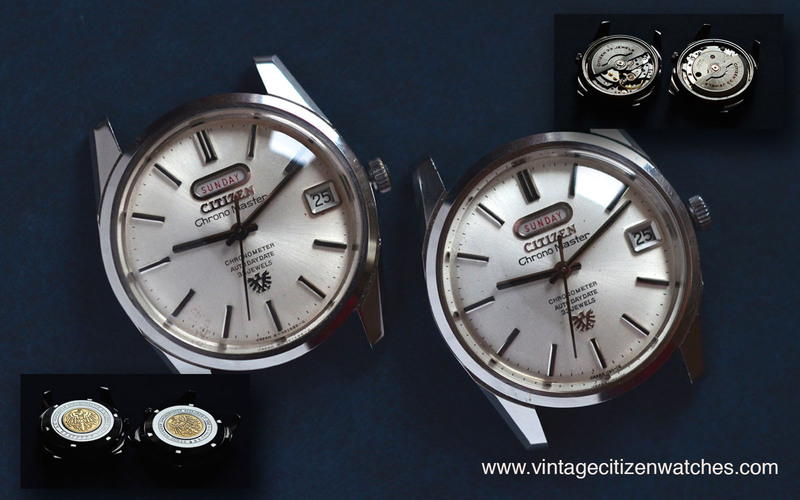 Both of them are marked with the famous eagle logo and the Citizen ChronoMaster writing. The eagle on the plastic one is applied. The inside lining is, as pictured, red. Read about the Chrono Master strap & buckle HERE. My friend, Stephen , did an extraordinary work putting together all the info that summarises the development of Citizen movements since the very first day of the company’s existence. This is an ongoing project that I am sure it would be a great source of useful information for all of us. All the data is introduced in chronological order. Thank you for all the effort placed into this tremendous research! 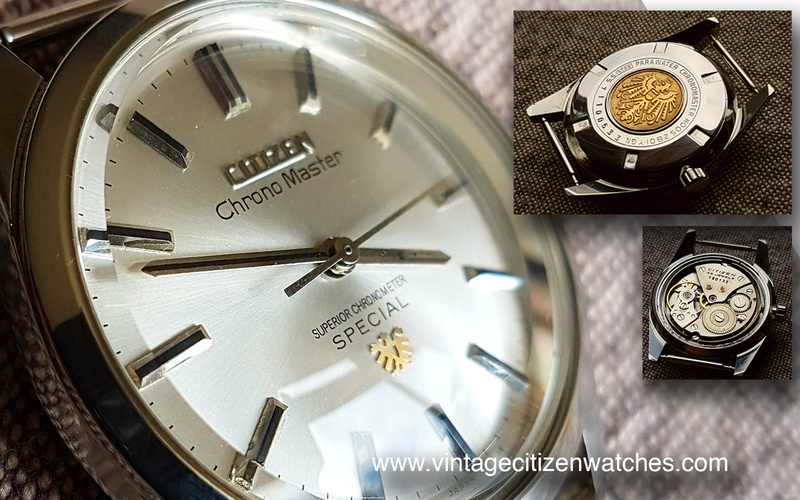 “Citizen Chrono Master”, what a beautiful sound! This is the Day-Date automatic version, ACSS 2929 Y GN2. It is made in a stainless steel case with a screw in caseback. On the caseback the eagle medallion gold inlay proudly proves the high grade of the watch. The case finish is superb, having clean lines, angles and polished surfaces. 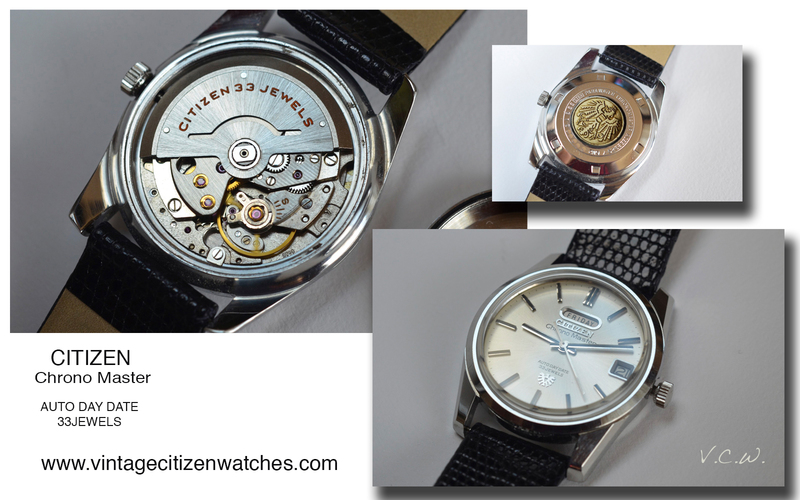 The movement is the Citizen calibre automatic 5240 with 33 jewels, beating at 18,000 bph. It can be hand winded too. Chronomasters can also be a date only or even no date. There are some Chronomaster movements adjusted to a higher precision called Chronometer. This was possible by the adjuster positioned on the balance. It is a quick set date, and it hack for better time setting. The day changes by advancing the hour hand past midnight. Some of these watches came on leather straps, others on stainless steel mesh bracelets. I have yet to find a real one on bracelet. The one presented here was made in 1968 and back then had a price list of 28,000 YEN.